A compact and reliable water filter, purifies about a litre of water per minute. 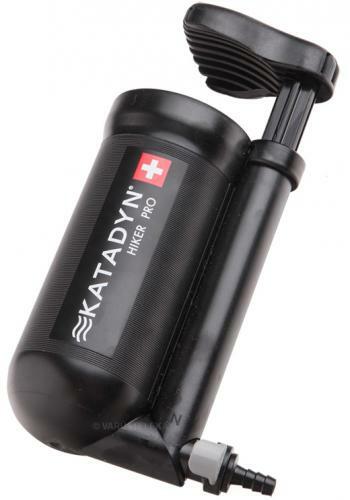 Made by Katadyn, this here is Swiss quality. 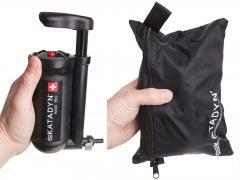 A plastic shell with active charcoal innards through which you pump the water and it comes out clean. Filters by 0,2 micron, which means 99,999 % of bacteria and protozoa won't get through, but to kill viruses you should use purification tablets. Also neutralizes any nasty flavours to some extent. You put the other tube into the water source and the other in your bottle or cup or whatever, then you pump it through the filter. Use the pre-filter to sort out larger debris in murky water. Very simple. Works with many hydration bladders too, for example CamelBak and Source. The following table shows the most common pathogens that make drinking water risky. The order is from largest to smallest: filters are rarely able to remove viruses from water, so it's recommended to use purification tablets after filtering for the best effect. Service life about 1150 litres. Weight 310 grams, dimensions 7,6 x 16,5 cm, diameter 6,1 cm. 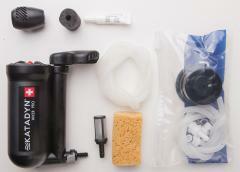 Comes with a carrying bag, tubes, pre-filter, cleaning sponge, drinking bladder adapter and a small tube of lubricant. Also included is a multi-language user's manual, which you should read through before use. The manual is also available in PDF form in the official Katadyn site. 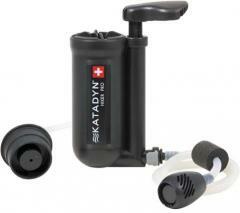 Katadyn specializes in water purificating thingies, and is one of the leading brands in this area. These are quality products made in Switzerland.